Facts about Bluetick Coonhound Dog, "Scientific name for Bluetick Coonhound Dog, or domestic canine, is Canis lupus familiaris". The Bluetick Coonhound Dog is one of those dogs bred in the USA who are not only muscular but also speedy. Besides this, the Bluetick Coonhound Dog have an extremely astute sense of smell, just like other hound dogs. The Bluetick Coonhound Dog have moderately glossy and coarse coat, which is covered by black & white mottling that gives out an impressive navy blue color. In fact, this is where this dog acquired its first name, the Bluetick. His keen eyes depicts a typical hound expression, showing no signs of phobia or nervousness. You can expect this hound to chop, squall or bawl while on the trail. He is quite a vocal dog and they are friendly to new folks as well as other dogs they may meet on the trail. Bluetick Coonhound Dogs sweat glands are between their paw pads. They are social, intelligent and loyal dogs, of which, these features are always conspicuous in their general disposition. The Bluetick Coonhound as said earlier is a quick dog who is cheerful and playful. The Coonhound is an active dog who should be taken for walk at least twice a week. Bluetick Coonhound Dog coat lies loose to the body and it’s neither too short nor small. It normally appears glossy and smooth, tinted with navy blue color all over his thickly mottled body. Differently shaped black spots govern the sides, back and ears. Sometimes, tan markings are seen over the eyes, chest and cheeks while the red ticking on the legs. For most of the Bluetick Coonhound Dog, the blue ticking is rather common than the white ticking. The Bluetick Coonhound Dog has a body which extends well down towards the elbow meaning that its body has great depth and less width. Bluetick Coonhound Dog chest, especially at the front, is fairly even up to the shoulders. For males, the Bluetick Coonhound Dog chest’s girth is between 26 and 34 inches (66 to 86.3 cm) while for the females it is between 23 and 30 inches (58.4 to 76.2 cm). The average body weight is 45 to 80 pounds (20.4 to 36.2 kg). Its long ribs tappers smoothly toward a medium tuck-up. The top-line lying on a muscular back slopes downwards slightly from the withers to the hips but Bluetick Coonhound Dog broad loin is slightly arched. A Bluetick Coonhound Dog’s mouth can apply approximately 150 to 200 pounds of pressure per square inch and an American Pit Bull Terrier, German Shepherd Dog and a rottweiler can have 320 LBS of pressure on avg. All dogs are identical in makeup big or small– 42 permanent teeth and 321 bones. Bluetick Coonhound Puppies have 28 teeth and when they become adult Bluetick Coonhound Dogs they have 42 teeth. The Bluetick Coonhound Dog are generally healthy but they may suffer from the Krabbes disease, the cataracts and the hip dysplasia. The Bluetick Coonhound Dog require regular exercise as well as regular maintenance of their eyes and ears to prevent infections. They have an average lifespan of about 11 years. 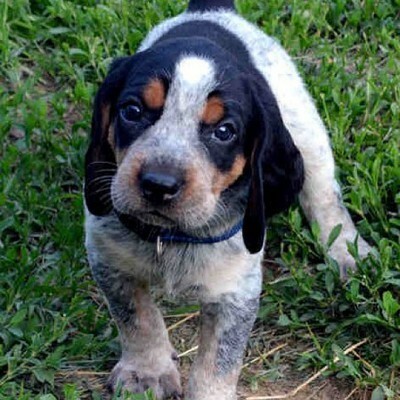 When purchasing a Bluetick Coonhound Dog from a breeder, make sure to find a good breeder with references, check at least two to three of the puppies that were purchased from this breeder. Bluetick Coonhound Dogs have two times the amount of ear muscles than people. A Bluetick Coonhound Dogs can hear a sound at four times the distance of a human. Sound frequency is measured in Hertz (Hz) Def-Hertz is the measurement of frequency, explicitly it's one cycle per second. The higher the Hertz are, the higher the pitched the sound is. Bluetick Coonhound Dogs hear best at 45,000 Hz to 65,000 Hz, while humans hear best at around 20 Hz to 20,000 Hz. The State Dog of Tennessee is the Bluetick Coonhound Dog. Where they think it was first breed. Selective breeding in Louisiana of Foxhounds, Curs, Grand Bleu de Gascogne (French Staghound) and English Coonhounds produced the Bluetick Coonhound Dog. The (UKC) United Kennel Club recognized the Bluetick Coonhound Dog as the Coonhound and English fox, which included the English Coonhounds, Bluetick and Treeing Walker as all in the same breed. Eventurally the Bluetick Coonhound Dog was separated into its own separate breed. In 2009 (AKC) American Kennel Club recognized the Bluetick Coonhound Dog. A Bluetick Coonhound Dog is an omnivore, (definition-they eat both other animals and plants). All Dogs are direct descendants of wolves. The number one heath problems amongst Bluetick Coonhound Dogs is obesity, so always make sure your dog doesn't get to fat. Many foot problems that Bluetick Coonhound Dogs have are just an issue of long toenails. Bluetick Coonhound Dog’s nose prints can be used to identify them, their nose prints are like a humans finger print. A Bluetick Coonhound Dog smells more than 1,000 times stronger than that of a human. A Bluetick Coonhound Dog’s nose, secretes a thin layer of mucous that helps it absorb scent, after that they lick their noses and sample the scent through their mouth. Bluetick Coonhound Dogs pant to keep cool with 10 to 35 breaths per minute with an average of 24 breaths per minute. A large dog breed resting heart beats between 60 to 100 times per minute, and a small dog breed’s heart beats on average between 100 to 140 pant a lot.